The first rapid growth spurt of the universe's most massiveblack holes occurred much earlier than astronomers previously thought, and arestill growing fast, a new study finds. A team of astronomers from Tel Aviv University in Israeldetermined that the first period of fast growth of the most massiveblack holes occurred when the universe was only about 1.2 billion years old? not 2 to 4 billion years old, as had been thought. 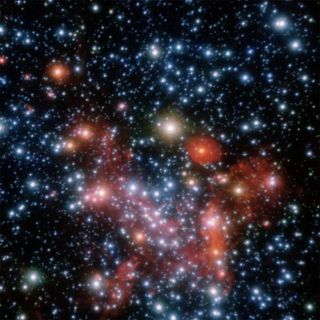 Astronomers estimate theuniverse is about 13.7 billion years old. Most galaxies in the universe, including our own Milky Way,harbor supermassiveblack holes at their center. These black holes vary in mass from about onemillion to about 10 billion times the mass of the sun. To detect these giants, astronomers look for the enormousamount of radiation emitted by the gas that falls into the black holes whenthey are activelyaccreting matter. This gas pouring into massive black holes is thought to bethe means by which they grow. The new research is based on observations from some of thelargest ground-based telescopes in the world: Gemini North, located on top ofHawaii's Mauna Kea volcano, which rises more than 13,000 feet (over 4,000meters) above sea level; and the Very Large Telescope Array, atop Cerro Paranalin Chile. The observations showed that the black holes that wereactive when the universe was 1.2 billion years old are about 10 times smallerthan the most massive black holes that are seen at later times. They are,however, growing at a much faster rate, which would make them much more massivenow than their later counterparts. By measuring the rate of growth, the researchers were ableto estimate what happened to these objects at much earlier and much latertimes. The team found that the very first black holes ? those thatstarted the entire growth process when the universe was only several hundredmillion years old ? had masses of only 100 to 1,000 times the mass of the sun. These black holes may be related to the very first stars inthe universe, researchers said. The astronomers also found that the subsequent growth periodof these observed black holes, after the first 1.2 billion years, lasted only100 to 200 million years. The new study is the culmination of a seven-year-longproject at Tel Aviv University designed to follow the evolution of the mostmassive black holes and to compare them with the evolution of the galaxies inwhich they reside.